Pitso Mosimane says Mamelodi Sundowns cannot be expected to win every match they play following their 2-0 defeat to Baroka in the Telkom Knockout. A 22nd minute Mdatsene Mduduzi penalty and own-goal from Reyaad Pieterse on 68 minutes sealed the result, and progression to semi-finals of the competition for Bakgaga. 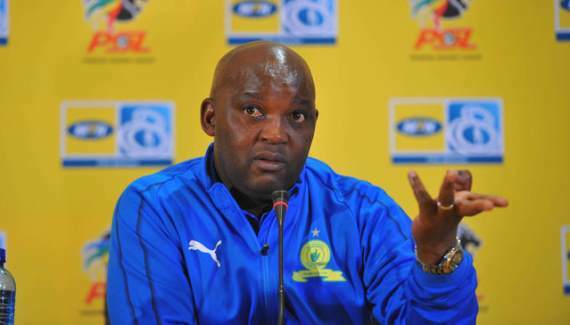 Mosimane will now turn his attention back to the Premiership, where Sundowns are currently in sixth place on the league standings, as well as the CAF Champions League. Mosimane told KickOff: “We want the Telkom, but we can’t win them all hey. You’ll win everything? He added: “The Champions League [first leg] final was played yesterday [Friday] and the boys were texting, not happy…should have been there. That’s the space we operate in, to represent South Africa and to make sure we get the rankings and do what Orlando Pirates did. Up next for Sundowns is a league clash with Free State Stars at Loftus Stadium on Wednesday.